Register for the conference at www.armouredvehicles-sa.com/vuelio by 14th December to save £400! Delegates who attend the two-day conference will benefit from exclusive Situational Awareness Military briefings from the United Kingdom, The United States, Germany, Norway, Romania and New Zealand, and they will gain the opportunity to meet with leading OEMs and System Integrators. 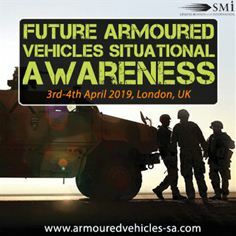 Future Armoured Vehicles Situational Awareness 2019 will also provide attendees with the opportunity to hear the very latest technological developments from research and industry that are enhancing combat effectiveness and connectivity, including: vetronic architectures, communications, battle management, acoustic sensors, optronics, displays, active protection and defensive aid suites. Day 1 of the conference will be opened by keynote speakers: Lieutenant Colonel Simon Routledge, SO1 Land Systems, Platforms Division, DSTL, UK MoD and Mr Hans-Josef Maas, Armoured Fighting Vehicles, Vetronics Project Leader, Federal Office of Bundeswehr. Day 2 will be opened by keynote speakers: Colonel (ret’d) Mike McCarthy, Deputy to the Commanding General, Maneuver Support Center of Excellence, United States Army and Major Warren Brennan, SO2 Communications and Vehicle Systems, British Army.